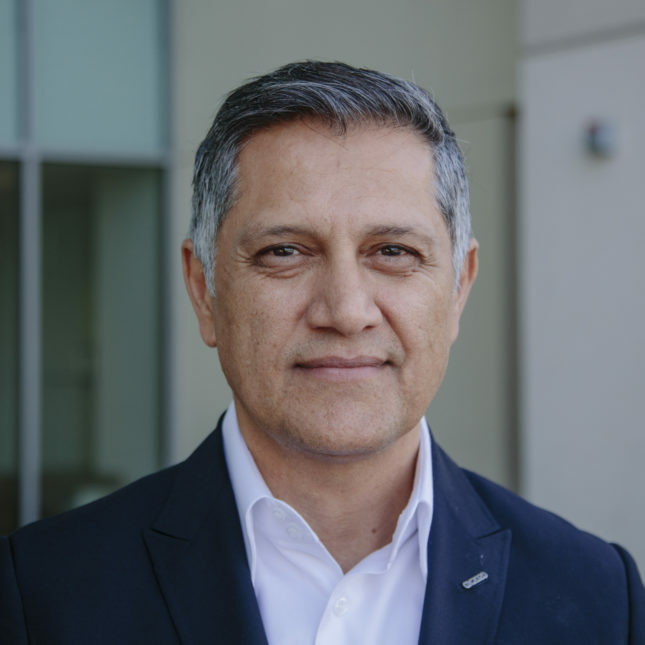 Joe Kiani, founder and CEO of Masimo, at the company's headquarters in Irvine, California. IRVINE, Calif. — Joe Kiani likes to point out that the most worn spot on most medical monitoring devices is the mute button. He’s out to change that — and, he hopes, to stop the epidemic of preventable hospital death that kills tens of thousands of Americans each year. It’s not a glamorous cause. And Kiani is not a household name. But he is a multimillionaire with a proven track record of using engineering smarts to fix dogged problems; he made his fortune improving the humble pulse oximeter, which measures oxygen saturation in the blood. Now, he’s pushing a nerdy, but elegant, idea for saving lives: prodding manufacturers of medical devices and electronic records to open their platforms so all the systems can talk to each other. His tech fix — if widely implemented — could bring order to the cacophony of beeps, buzzes, and blaring alarms that can so overwhelm nurses and doctors that they push “mute” and miss true emergencies. It could make it easier for staff to monitor patients with complex needs. And it could flag, in advance, potentially fatal errors like incorrect dosing and drug allergies. Manufacturers, naturally, aren’t so eager to share their computer code. But Kiani is not one to give up. In the past five years, Kiani has encouraged — some would say browbeat and publicly shamed — 70 companies to sign a pledge to open their platforms. The group includes some of the biggest medical device manufacturers — who also happen to be some of his most bitter corporate rivals. Of course, making a pledge is one thing. Carrying it out is another. While smaller companies have been eager to open up their data, many heavyweights are moving slowly. Some cite concerns about patient privacy; others are working on big integrated systems to sell to hospitals and aren’t interested in cooperating with competitors. Makers of electronic health records have been especially reluctant. Yet outside experts such as Dr. Peter Pronovost of Johns Hopkins University, a world leader in patient safety, see glimmers of hope. Pronovost once thought it would take federal regulation to force companies to make their devices talk to one another, which he calls a crucial safety feature, akin to making sure a pilot can can check on the plane’s landing gear from the cockpit. He’s heartened by Kiani’s progress. Zoll, which manufactures defibrillators and data systems in ambulances, was one of the first to open its data. Patient information captured in Zoll-equipped ambulances can now flow directly into the patient’s electronic health record, for review by hospital staff. As a next step, CEO Rick Packer is pressing the health records companies to send data to his ambulance devices, so paramedics have crucial background on the patients they’re transporting. 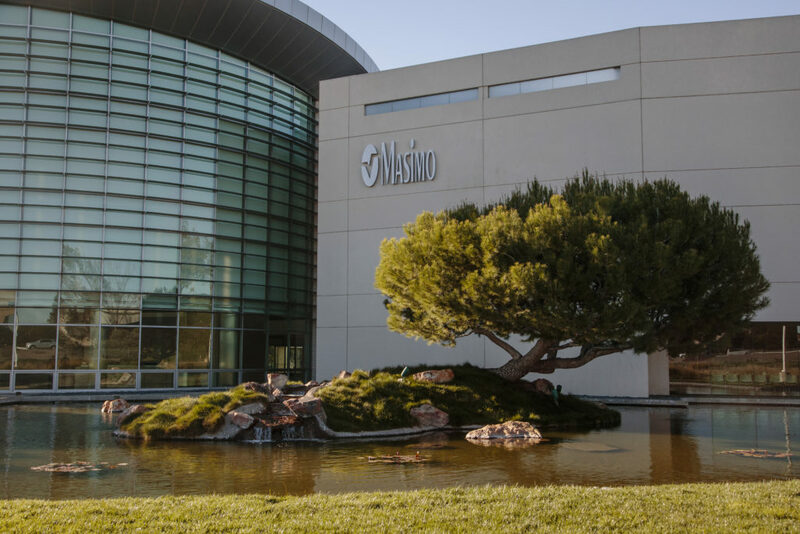 Kiani’s medical device company, Masimo, has its headquarters in Irvine, Calif.
Kiani runs his own medical device company, Masimo, from a building so airy and modern it stood in for Stark Enterprises in the first “Iron Man” movie. With a volleyball court in the lobby and hemp milk and artisanal chocolate served in the employee cafeteria, the building pulses with California startup vibe. Kiani, 51, a father of three with slightly silvering hair and a penchant for wearing dark tailored suits with no tie, lives in nearby Laguna Beach. But his life wasn’t always so easy. Kiani raced through high school, finishing at 15, and planned to become a doctor. But chemistry at San Diego State University foiled him. Instead, he turned to engineering. But devices being used in the mid-1980s were terrible. Just about any patient movement caused the devices to sound a false alarm that oxygen levels were low. Patients would then be blasted with too much oxygen, which often led to blindness in premature babies. Drawing on what he’d learned from fields like submarine warfare and satellite communication, Kiani and colleagues came up with adaptive algorithms that helped the oximeters ignore signals that made no physiological sense. That cut down on false alarms and improved reliability. 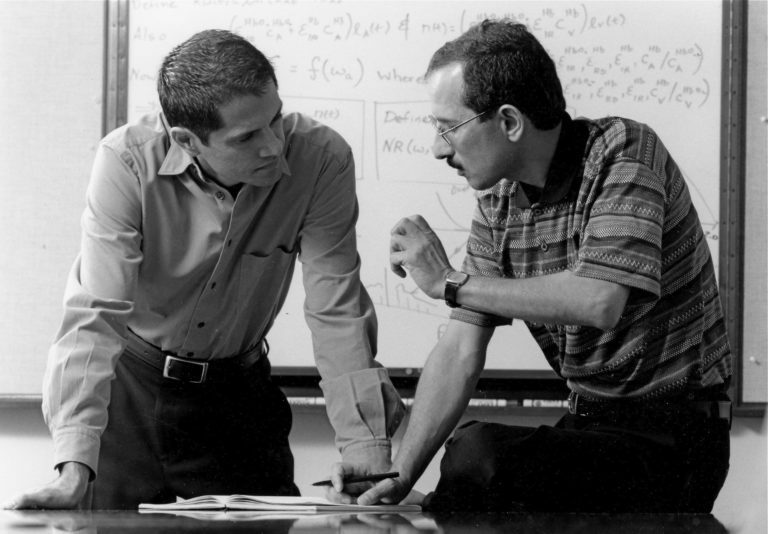 In 1989, Kiani and engineer Mohamed Diab launched Masimo. It began, as so many of California’s great companies have, in a garage. The next decade was tumultuous. Bigger companies were trying to steal his ideas. Kiani couldn’t seem to get hospitals to look at his device. At times, his sales reps were even physically escorted off hospital grounds. “It was so frustrating. I can’t even tell you,” he said. Kiani had stumbled into the scandalous world of hospital GPOs, or group purchasing organizations. His pulse oximeter was being locked out by larger competitors who paid hefty fees to hospital purchasing agents in order to land exclusive sales contracts. Kiani was initially afraid to get involved, not wanting his young company to be blackballed. “It wasn’t in my personal interest to try to change this industry,” he said. But he did speak out, in a series of high-profile articles and in testimony before the Senate in 2002. “He really helped open up the market for smaller companies that had better, disruptive technologies,” said Ronald Newbower, an MIT-trained physicist who’s spent decades using technology to improve patient safety at Massachusetts General Hospital. As hospital purchasing rules began to change, Kiani’s company began selling huge numbers of pulse oximeters. It is now one of the top sellers in a market estimated at $1.5 billion globally. The company is moving into other areas, including brain monitoring. Kiani is extremely proud of Masimo’s technology and the sleek, iPhone-like devices he’s been creating of late. But the company took dings — and received an FDA warning letter in 2014 — for not adequately responding to complaints about some of its devices. Kiani said the company has since overhauled that process. But his business success wasn’t enough. The fight to open up hospital purchasing practices had stirred an activist bent in Kiani. He soon found his target. 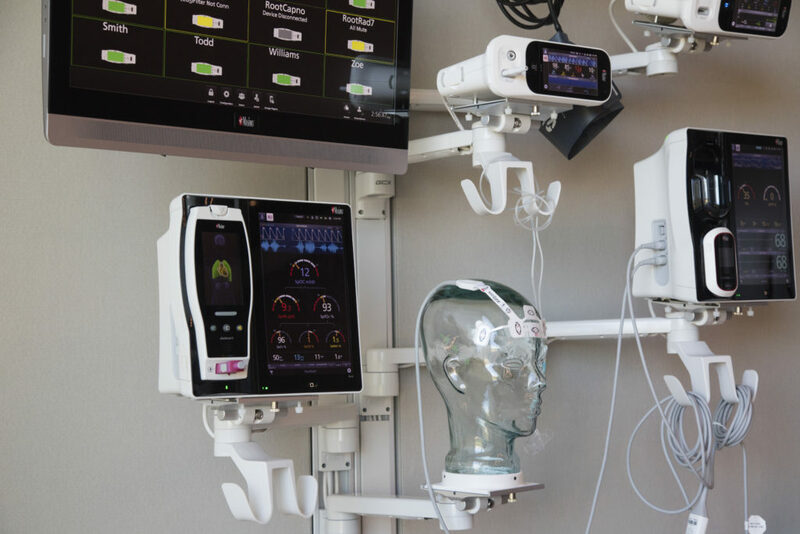 Masimo medical monitoring devices are seen on display on a wall at the company’s headquarters. After years of working in the medical field, Kiani knew the grim statistics: Some 100,000 patients in the US die each year of medical errors, according to a 1999 Institute of Medicine report. Some researchers, using newer screening tools, think the number could be four times higher. Others say it’s lower. But everyone agrees these deaths can and should be prevented. When Kiani began to put faces to the statistics, he was shaken. One of those faces belonged to 11-year-old Leah Coufal, who died in December of 2002 at Cedars-Sinai Medical Center in Los Angeles. She’d had routine surgery to correct a mild chest deformity and apparently received a massive dose of fentanyl to control pain — enough to stop her breathing. Her mother, Lenore Alexander, couldn’t talk about Leah’s death for a decade. When she started speaking out, Kiani listened. He was shocked to realize his own daughter — who is fine now — had surgery in the same hospital, with the same surgeon, in the same week as Leah. He was also shocked to find Leah had not been monitored after surgery, not even with a simple pulse oximeter. Another name Kiani couldn’t keep out of his mind at the time was Rory Staunton, a 12-year old from New York who scraped his arm in gym class, then died from a sepsis infection that simple screening tools could have detected. “He wondered: “Why are people going into hospitals and not coming out?’” said Frederic J. Harris, an electrical engineering professor at San Diego State University who taught Kiani and remains close to him. Kiani decided to tackle such senseless deaths through engineering. Critics, however, look askance at the high glitz content of Kiani’s annual summits, run through his Patient Safety Movement Foundation. Some critics also raise questions about the money Kiani has handed out to politicians. His foundation, which is funded by Masimo and other corporations, paid $315,000 to Clinton for a 2014 speech (though the former president has waived his fee for the past three years, Kiani said). Another of Masimo’s foundations has contributed $2.5 million to the Clinton Foundation. “That’s a lot of money. You wonder if it’s a way to legally channel money to a candidate,” said Beth Waldron, a patient safety advocate and consultant in Chapel Hill, N.C. She once hoped to work with Kiani on her key issue — death from venous thromboembolism, or blood clots — but grew concerned after looking at how the foundation operates. “I’ve seen very little substantive action coming from this particular patient safety organization,” said Waldron. She notes that plenty of other groups also work on patient safety and, in her view, get more done. “I don’t see the results to justify the costs,” she said. Kiani said he resents any implication that he’s trying to buy access to promote his company or alter tax policies that affect his industry. And many in the field, even competitors, say Kiani’s work is making a difference, by turning a spotlight on the uncomfortable topic of patient death and also by reshaping market forces. Medtronic, a medical device giant, has started to embrace open platforms, including in some of its insulin pumps and glucose monitors. Another powerhouse, Philips, has been working to develop industry-wide standards so devices can talk to each other. Electronic medical records makers also need to come aboard, noted Johns Hopkins’s Pronovost, or they risk becoming “dumb data entry and billing systems” without access to the streams of data coming in from monitors and devices — or the powerful analytic tools used to make sense of it all. Ed Cantwell, who runs the nonprofit Center for Medical Interoperability, said it’s a national embarrassment that companies have been allowed to own patient data instead of sharing it. That can’t come too soon for Kiani. He’s already revved up about what it could all mean: Once more devices are linked and data is flowing, he said, computers should be able to predict in advance which patients are headed for trouble and alert clinicians. All that’s needed, he said, are a few good algorithms. This is a wonderful article about an exceptional human. It was originally written in 2017. However, you (Editor or Author) had to turn this into a political statement that is not true. Mr. Kiani’s family arrived in the US from Iran during a massive exodus of political and religious refugees at the end of the Shah’s regime. The US welcomed them with open arms. Times are different now than some 40 years + ago. Keep your reporting to the facts, please, focusing on the incredible accomplishments of an exceptional person whose company’s contributions have been immeasurable instead of inserting your personal political statements that interrupt the flow of an otherwise informative article. Is there any way to SPEAK with Joe Kiani? It is nice to see someone take on the medical device part of healthcare. It falls under different FDA Regulations than drugs and an approval process (can’t do a placebo controlled study). What needs to happen, is look at what has been done with medication errors for decades and roll devices into Medication/Patient Safety Committees at hospitals, finally get the Universal Identification Codes/GTIN placed on devices to track implants placed in patients, etc. for recalls and implement a Med Watch program for Devices, like for Drugs. The inability of equipment to talk to each other is an issue also and was most likely created by industry to get you to purchased their catalog of products. “Use our Smart Pump with the rest of our technology”. Lastly, I am not sure the EHR Companies are making that easy and testing the interfaces needed. I have heard in the past years (and maybe it’s fixed now) patient safety issues with point of use machines.